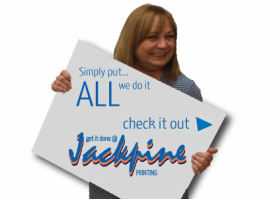 Graphic Design: The staff at Jackpine offers you more than 70 years of combined experience. Using programs like PageMaker, Corel, and the Adobe Creative Suite ver-6 - we can take your project from concept to completed. Printing: Everything from black and white business cards to full color short run full color brochures are done in house. We also can do the design for a longer run full color or continuous forms that we can have printed elsewhere for you. Wide Format Printing: Not only do we take care of the little things, we can also complete the large projects as well. Our wide format printing can handle any document up to 3’ wide and 12’ long. Laminating/Finishing: Looking to put the final touch on a print project, we can also assist you. Our laminating and finishing is neat, clean and professional. We can laminate documents up to 2’x3’ in size, giving you and your business maximum flexibility in its presentation quality.